What do I like about the holidays? Everything! The lights, the decorations, the shopping, the gifts, the positive spirits and yes you guessed it right ..the treats! At this time of the year I like to take a few days off from work and spend time with the kids. I love to make and /bake treats with them and I know that when they grow older this is one thing they will always remember. So why not indulge them and ourselves a little bit! Also making these treats and gifting them to our close friends makes me so so happy! 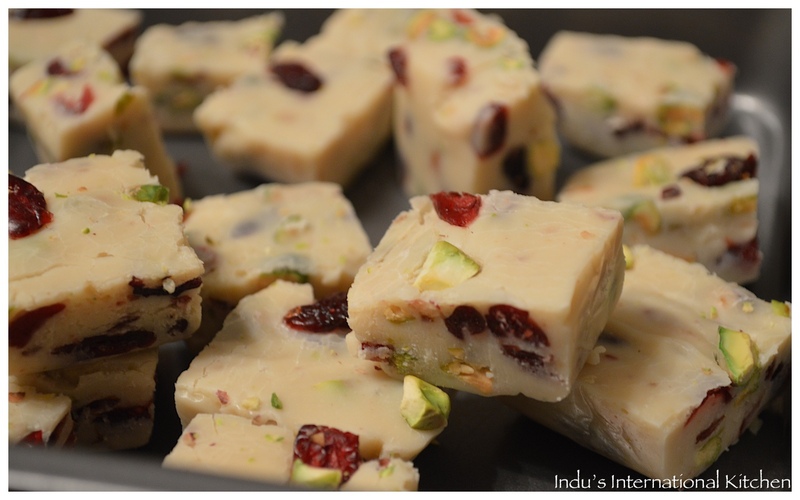 and today I am posting the white chocolate cranberry pistachio fudge. As I was searching for fudge recipes this one caught my eye for the sheer colorfulness of it. The recipe I saw had pecans in it instead of pistachios but I thought adding ‘green’ (with pistachios) would make it perfect! Plus the salty pistachios goes perfectly with the chocolate and the cranberries. Simply divine.! This is again one easy recipe and it came out perfectly! I could not stop admiring how beautiful these ‘white with red and green speck fudge’ squares looked! Take a square baking pan and line with wax paper or Al foil such that you have extra paper hanging pt of the edges (overhang). Brush the wax paper with a little oil and keep this aside. Take a medium cooking pot and add the chocolate chips and the condensed milk to it. Heat on low to medium heat stirring constantly until the chocolate chips are completely melted and you get a smooth consistency. Alternatively you can use a glass mixing bowl and heat this in a microwave for about 2-3 minutes at 30 sec intervals(Stop every 30 seconds and stir using a spoon ). Add all the rest of the ingredients next and mix well and immediately pour into the prepared pan. Flatten the surface with the back of a flat spoon until you get a smooth surface. Place the pan in the refrigerator for about 2 hours to chill. Once the fudge is set, turn the pan over a cutting board and take the paper out gently. Then using a large sharp knife make cuts on the fudge block to get about 36 1 inch squares. I made your chocolate caramel walnut fudge. it was easy to make and tasted absolutely Divine! 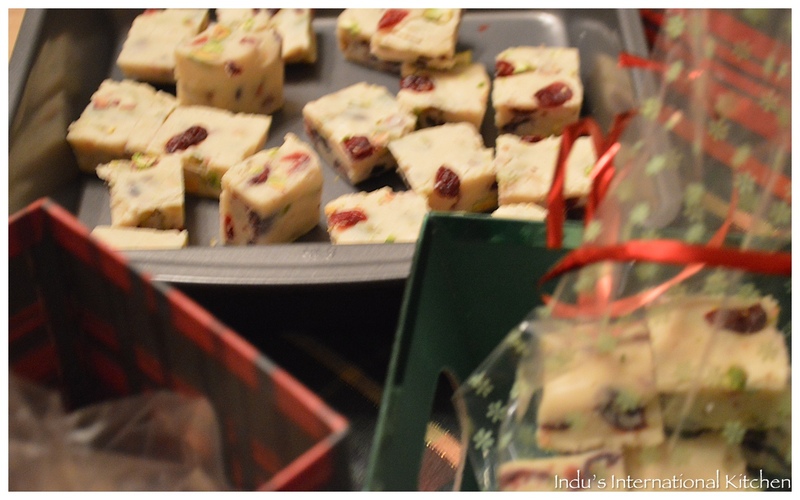 Beautifully festive Indus, love fudge, and they look like they would be just in time for the holidays :). Thanks for co-hosting. These look delicious, with cranberry and pistachio in there it’s hard to go wrong, plus fudge is always good. I am not generally a white chocolate fan, but I might have to make an exception or try adapting. Thanks for sharing. Gorgeous, Indu 🙂 Love the little bags! Love the festive colours of these beautiful little fudgey treats!